Aerodynamic design for noise optimisation with 1.8 m cord for maximum flexibility. Get professional results with Philips HP8190 ans use narrow concentrator for precise styling. 6 flexible speed and temperature settings and a coolshot setting that sets your style. 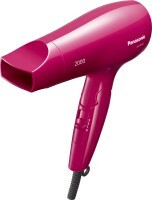 Volume diffuser enhances volume, for curls and bouncy styles and professional 2000 W gives perfect salon volume. IonBoost: Ion conditioning for shiny, frizz-free hair.